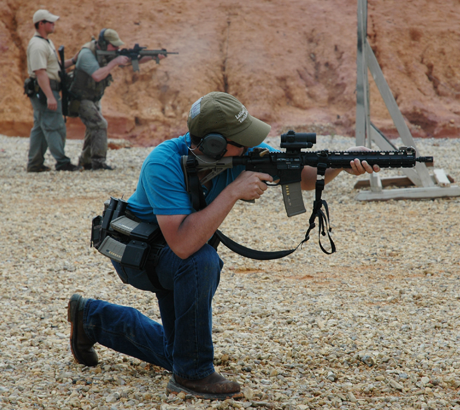 This course is designed to develop skills for the student who uses his weapon in a tactical environment. The course will start with reviewing the fundamental shooting skills. You will soon advance to skills that will reduce your reaction time, allow you to shoot faster with higher degree of accuracy, and increase your confidence with your carbine. 600 rounds of carbine ammunition (approximate). Absolutely NO penetrator ammo (M855 green tip, Wolf penetrator, SS109). Pistol, holster, belt, three pistol magazines, pistol magazine holders, carbine, sling, four carbine magazines, carbine magazine holders, wraparound clear eye protection, ear protection, weapons cleaning kit, water bottle, and rain gear. **Students must arrive with irons and optics zeroed. Please also note that for our Intro, Level I and Level II Pistol courses, for our Pistol Workshop and for our carbine classes that incorporate any pistol work, all students must receive prior permission from VATA to work with an IWB holster setup. If a student has not previously taken a VATA course to be evaluated by an instructor, they would need to bring a belt mounted, outside the waistband setup with them to use until an instructor can determine that the student is not a safety risk and approve their use of an IWB setup. This rule has been implemented purely as a safety precaution. We, by all means, believe in training the way we carry, but we also believe the fundamentals must be sound before a student advances to an IWB carry setup, and the focus of our introductory level classes is to get those fundamentals where they need to be. We appreciate everyone's understanding and cooperation on this matter.